FGK Dri-FIT is a high-performance, microfiber, polyester fabric that moves sweat away from the body and to the fabric surface, where it evaporates. As a result, Dri-FIT keeps athletes dry and comfortable. As a light, breathable material, these shirts do not need to be ironed (even when they initially look ‘wrinkly’ which they tend to do). Simply wash the shirt and hang let it hang to dry quickly. Any wrinkles will soften after a few minutes of wearing the shirt. Throwing the shirt in the hot dryer or running a hot iron over the material can potentially harm the fabric! 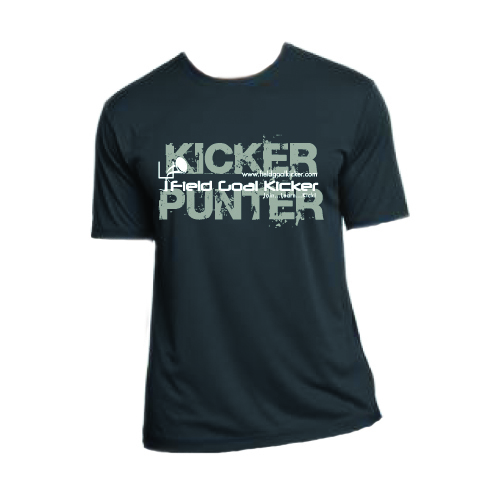 Our FGK performance shirt design was created in-house for our local kicking clinic students. The shirt is offered in two neutral grey colors (a light and a dark) so that either could be worn with most any shorts. Our students loved the shirts and feedback was very positive for both the design and the light, quick-dry feel. We think you’ll love them too! Dri-FIT technology is THE way to go with performance kicking shirts today.